1. The Man on the Moor. Friday, May 18, 7.45pm, £14, The Capitol studio, Horsham, 01403 750220, www.thecapitolhorsham.com. On December 12, 2015, an elderly looking gentleman was found dead on Saddleworth Moor. He was carrying no form of identification. Train tickets in his pockets showed he’d travelled 200 miles, apparently just to die. Despite a national campaign he remained unidentified for more than a year. As the police went public with the man’s image, 40 different people reached out to claim ‘the man on the moor’ as their missing husband, father or brother. These people are the left-behind, the people Max Dickins looks at in The Man On The Moor. 3. Ivo Graham: Educated Guess. 4. Me and My Bee. May 19, £25, 7.30pm, The Hawth, Crawley, 01293 553636. With a career spanning more than 40 years, Brian Conley is one of the UK’s best-loved personalities and fresh from his recent appearance on BBC One’s Strictly Come Dancing 2017, Still The Greatest Entertainer – In His Price Range will see him entertaining audiences with a mix of music and comedy, including some of his best-known characters, such as Dangerous Brian and Nick Frisby, as well as paying tribute to the many West End Musicals he’s starred in. 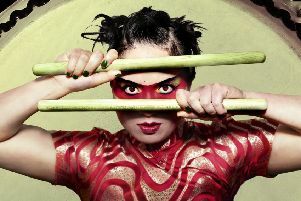 Sunday, May 20, 7.30pm, £10 in advance, £12 on the door, The Capitol studio, Horsham, 01403 750220, www.thecapitolhorsham.com. As usual, three top comedy circuit acts will be gracing The Capitol stage with resident host Kevin Precious returning to oversee the proceedings. This month’s trio of mirthmakers include: clever and inclusive young politico Joe Wells (top circular picture), propmeister extraordinaire George Egg and stylish globetrotting gagster Nick Wilty. Tuesday, May 22, 7.30pm, £10, The Capitol Theatre, Horsham, 01403 750220. This is an evening of four newly commissioned works from the daring Anthony Missen (Company Chameleon), acclaimed Abi Mortimer (Lila Dance), the award-winning Dam Van Huynh and the rising choreographic talent Nuno Campos. Visit www.intotodanceco.uk to find out more. May 23, 8pm, £15, The Capitol Theatre, Horsham, 01403 750220. Comedian Tom Allen (bottom circular picture) is touring the UK with his debut tour show. A spokes-person said: “Soaked in Tom’s signature waspish snobbery and self-aggrandising wit, Absolutely addresses the elephant in the room that Tom is still living at home with his parents – because he can’t afford not to – in Bromley, Kent – heart of leave voters and Theresa May’s Brexit Britain. He’s always at home in Alan Bennett and Mike Leigh territory as he shares with us his up close and personal experiences of suburbia, especially since the Referendum. Tom addresses the ‘difficult times’ we live in but were things better ‘back in the day’ when he was kid and you could fit 15 kids in one car?” Tom Allen’s unique style of sharp, acerbic wit and camp, riotous storytelling has seen him perform all over the UK, Europe, Canada, America, Australia and New Zealand. Find out more at www.tomindeed.com. 9. Jason Donovan and His Amazing Midlife Crisis. May 24, 7.30pm, £26.50, The Capitol, Horsham, 01403 750220. Jason Donovan’s latest tour offers fans an opportunity to see him like they’ve never seen him before. A spokesperson said: “At aged 49 ½ and with a wealth of tantalising tales under his belt, this autobiograph-ical show will take Jason’s 50th birthday as its starting point and will zigzag back and forth through his life.” It’s a night of songs and stories. Thursday, May 24, £20, 7pm, The Hawth, Crawley, 01293 553636. One Man’s Madness is a feature length rocku-docu-mocku-mentary directed by Jeff Baynes. It explores the story of Madness saxophonist Lee Thompson. The tale is told by Lee and his fellow Madness band mates, his family, friends and musicologists. The film will be followed by a Q&A session with Lee hosted by Chris Oxlade.